Pharmacology, Toxicology and Biomedical Reports,2017,3,3,66-69. Department of Pharmacology, Annamacharya College of Pharmacy, New Boyanapalli, Rajampet, Andhra Pradesh, INDIA. Background: Rostellularia diffusa (Willd.) is a traditional herb belongs to acanthaceae family. The whole plants are used as brain tonic in traditional practice. There were no earlier reports on the safety assessment of Rostellularia diffusa. Objective: the present study was undertaken to assess the safe use of this plant in traditional practice. 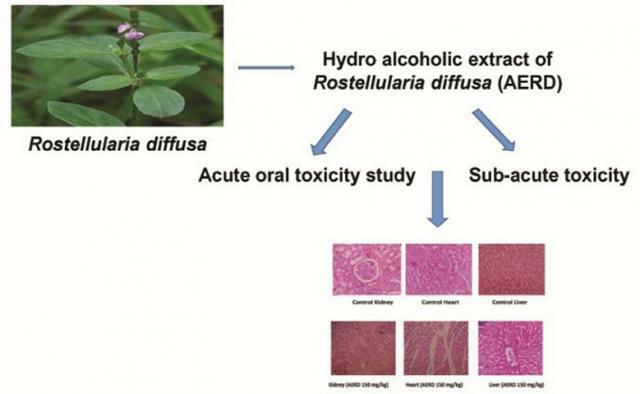 Method: The acute oral toxicity study of hydro alcoholic extract of Rostellularia diffusa (AERD) was carried out as per the OECD guidelines 423 and the sub-acute toxicity was carried out at a dose of 150 mg/kg and 300 mg/kg as per OECD 407 guidelines in male and female rats. Results: Rats were administered up to 2000 mg/kg as a single dose orally not caused any signs of toxicity or mortality in rats. In sub-acute toxicity study in rats, AERD at two different daily doses of 150 and 300 mg/kg for 14 days did not cause any significant change including the hematological and biochemical parameters. Histopathological examinations showed normal architecture suggesting no morphological disturbances. Conclusion: No deaths or any signs of toxicity was observed after oral administration in acute toxicity study up to a dose of 2000 mg/kg of AERD in rats and up to a dose of 300 mg/kg of AERD in sub-acute toxicity study in rats.